During recent years there has been much progress in understanding mass and energy exchanges in the soil-plant-atmosphere system. It is nowadays well acknowledged that these processes greatly influence the management of water resources in agricultural systems. Research advancements have produced innovative methodologies which are ready for being transferred to operative applications for improving the efficiency of water use in agriculture. "Efficiency" has become the key-word in all water management related issues, but in the context of agricultural water use, especially in Mediterranean regions, this issue is more and more representing the real challenge for sustainable growth and development. 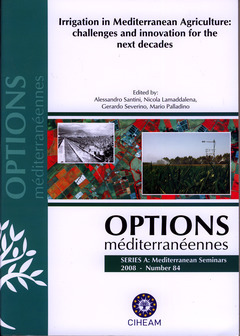 The scientific articles in this book highlight most recent findings in three main topics related to efficiency in irrigated agriculture: physiologic and genetic aspects, management and engineering aspects, exploitation of alternative water resources. Special focus is given to possible operational applications and future trends in water and soil management, also considering the indications of European Union contained in the Water Directive n.2000/60.